While I was living in Pamplona in Spain, I shared a flat with two other women: Raquel, a Spaniard; and Rosario, a Chilean. At first, I was worried that the set-up would not work. I wondered: can three women of three different cultures live harmoniously together in a small space? My fears turned out to be unfounded. We ended up getting along so well that had we not been of different nationalities, I would have wondered if we were not, in fact, triplets separated at birth. We spent many fun times together: playing the Carcassonne board game, watching movies, cooking together, sampling pintxos in the bars of the old part of Pamplona, hiking the Navarran countryside, or simply conversing with each other. We did special things during birthdays, consoled each other during sad times, took care of each other during times of illness or injury, and celebrated each other’s successes. I learned that yes, three women of three different cultures can live harmoniously together in a small space. Indeed, women can be great friends to each other. We are sensitive, intuitive, empathetic, caring, and generous — traits that make us good friends. Unfortunately, these same traits breed the cattiness at the root of women’s cruelty to women. For example, the same feminine intuition that makes us sensitive to others’ needs can make us touchy and judgmental, perceiving offense where none is intended. Our inherent gift for words, which enables us to say the right things to console the suffering, also gives us sharp tongues and the propensity to gossip. What must we do, then, to avoid falling into the vicious cycle of cattiness-begetting-cattiness and to enjoy our friendships with our fellow-women to the fullest? 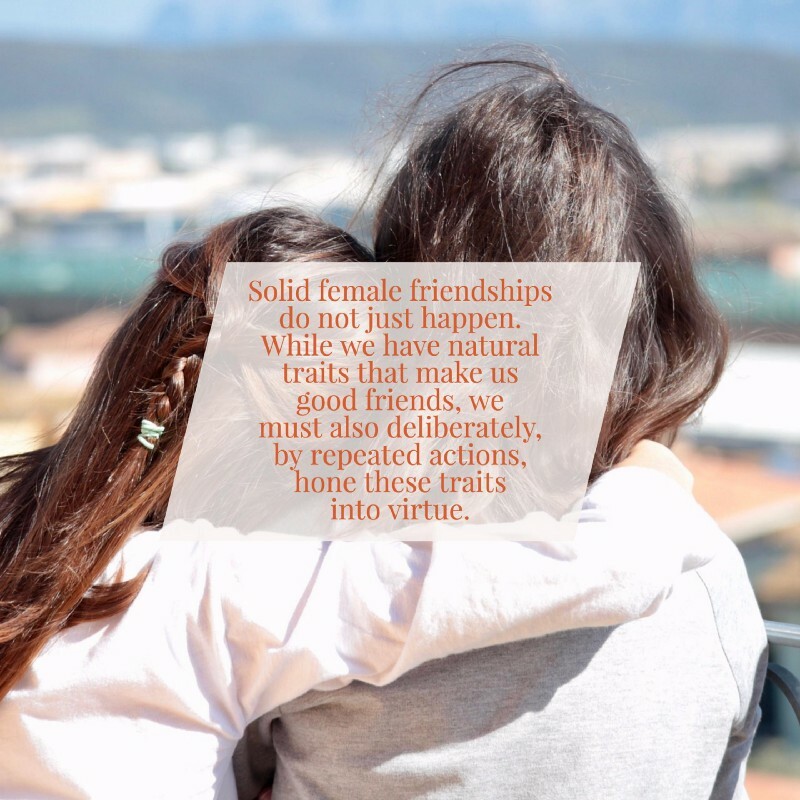 Solid female friendships do not just happen; they take deliberate effort on the part of all involved. While we have natural traits that make us good friends, we must also deliberately, by repeated actions, hone these traits into virtue. It takes effort to understand others, overlook minor irritations, notice others’ needs, and talk calmly about issues that crop up between friends. It is much easier to judge others hastily, to speak without thinking, to repay evil with evil. But efforts to be a good friend get reciprocated. The defeatist surrender to one’s own irrationality likewise gets reciprocated. I would not want to end this essay without thanking Raquel and Rosario for teaching me a lot about how to be a good friend. I will always remember their thoughtfulness, for example, in giving me Fermin the fighting fish on my birthday after they learned that I like fishes. I will also always remember their patience, for example, in listening to me talk when my Spanish was still poor or in being willing guinea pigs for my culinary experiments. These first-hand lessons on friendship are valuable gifts that I hope to be able to pay back, or forward.